The slow but apparent death of Super Kmart (or just Kmart for that matter) continues. Since I started this website in late 2011 the number of Super Kmart stores has shrunk from 26 to 23. The Portage, Indiana Super Kmart was closed and sold to Meijer in 2012; so far in 2013 the Queensbury, New York store was converted and now this store in Moon Township, Pennsylvania has closed. The Super Kmart concept has been slowly dying since Kmart's bankruptcy. In 2002 12 Super Kmart stores were closed and in 2003 58 stores closed. Since then numerous other Super Kmart stores were slowly closed or had their grocery sections removed. In 1993 a shopping development called Parkway Plaza was planned for the Northwest corner of Montour Run Road and Hershinger Road. A 173,000 square foot Super Kmart Center and a 109,000 Builder's Square II home improvement warehouse were the planned anchors of said shopping center. Plans for the Builder's Square location did not become reality and no other stores opened in the Parkway Plaza shopping center at the time (now known as Market Place). On November 13, 1994 the Super Kmart opened with a full-service restaurant, full-service auto center, florist, portrait studio, shoe repair shop, video rental store, and a Borics salon. The new superstore replaced a store at the Crafton-Ingram shopping center in Crafton; that store is now a Giant Eagle grocery store. Over the years this Super Kmart changed its video rental store into a game room and its florist into a team shop. The Borics Salon, shoe repair shop, full-service restaurant, and Penske auto service center were closed over the years. The Moon Township Super Kmart also had the 6 AM to 12 AM hours before the other locations received them briefly in 2012. The store also retained those hours until its closure was announced instead of reverting back to 24 Hours. Originally the store had 28 checkouts, but it had only 15 when it closed. Over the years Kmart reduced the hours of service counters (including removal of the Seafood counter) and used other methods to lower the amount of employees at the store. The Moon Township Super Kmart started with around 600 employees and had less than 150 when the closing was announced. The procedures for closing a Super Kmart are much like converting a supercenter and closing a regular Kmart at the same time. When the closing was announced the layaway area, pharmacy, game room, team shop, Olan Mills portrait studio and grocery counters were closed. The remaining fresh groceries were quickly cleared-out. Then, the grocery section signage and equipment were disassembled. 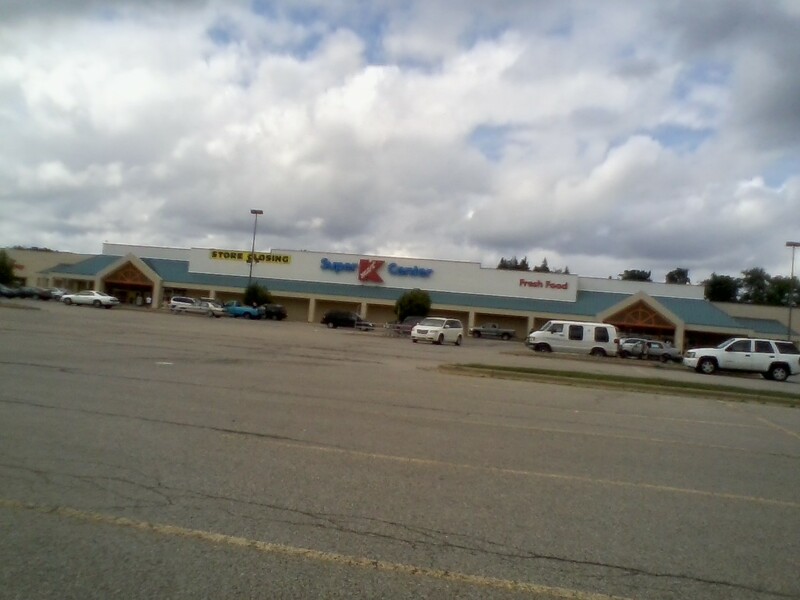 The grocery area was then used for "K-Mart's Flea Market" which was a collection of equipment, signage, and shelving from around the store put up for sale. Many boxed, canned and some frozen food was still for sale towards the end of the Going Out of Business procedures. Other departments throughout the store were pushed towards the front as the Going Out of Business sales moved further along. The final day open for the Moon Township Super Kmart was July, 7th, 2013. Chevron purchased the Super Kmart property with the intention of building a regional headquarters. Nothing is left sitting out front; there used to be vending machines, a ride for children, and benches here. The 24 Hours part of the sign are covered up. Sign with a different logo on Montour Run Road. The original green and white refrigerators were removed from this area to make the store look nicer and save energy. Thank you for visiting Dead and Dying Retail! 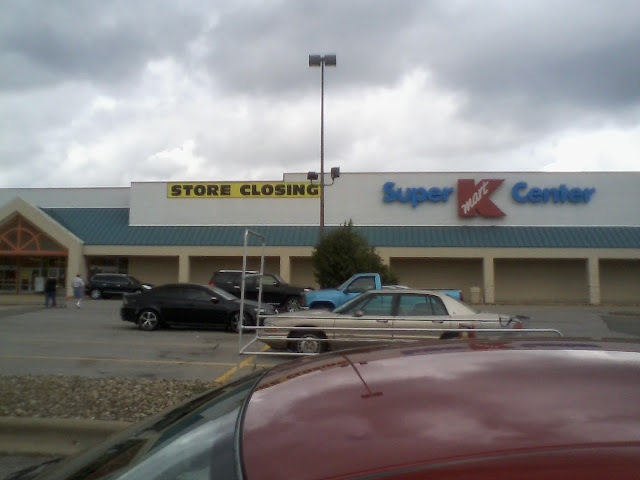 It is very sad to see this Kmart close, but I am glad that you were able to give it a proper funeral. This is one of the two Kmarts of any kind that I have visited in the last 10-11 years since Kmart left my local area and most of my region. I was pleasantly surprised by this store when I visited it in 2011. The grocery section was visually and functionally impressive. The regular departments were monotone and dull like many Kmarts with 1990s decor, but at least it was clean and well organized unlike most regular Kmarts that I have memories of or have seen on the Internet. There is a Sears at the nearby mall, The Mall at Robinson, and I believe that you have photographed a much older operational Big Kmart that is in Moon Township. Hopefully the loyal Kmart shoppers and the employees from this store will be able to find alternatives, but I guess there really isn't a Kmart alternative for groceries. Fortunately, it sounds like this store won't sit and rot like many other former Kmarts, but I'm guessing it will be torn down by Chevron if they are building a regional office. The K-Mart Flea Market thing is pretty funny. A few of our former Kmarts literally turned into flea markets including this hilarious specimen. Some of that signage they had in the flea market might make for interesting house/garage decorations especially if it has the Kmart logo. I don't know what my lifetime total is for number of Kmarts visited in my life, but it's probably somewhere in between 20 and 30. Of those, only one of those Kmarts is still open for business. Maybe I'm bad luck for Kmart! I thought this store was nice the first time I visited it in early 2013. I did not like to see the store so dead. I would have liked to have been able to see this store in its heyday with the places like the Auto Center and full-service restaurant open plus plenty of people shopping. This store was visible from the highway as sitting on top of a hill, but it was somewhat hard to find the top of the hill. All the other stores that opened in the area had a major toll on the business. I do not know if the building will get demolished by Chevron, but they did buy the property behind the building too. I probably will not be in Pittsburgh again soon to see what happens to the store. Most of the Kmart stores in my area are actually still Super Kmart locations. this retailer. I can say we had alot of good memories from beginning to end at this store and had numerous dedicated customers. It looks like they had already started clearing out inventory in that store in the January pictures. I wonder if the employees knew at that point that the store was going to close. That is a very clean looking store in the January photos and the employees took pride especially in the grocery portion of the store. Are the Super Kmarts in your area busy or does it look liek they are also on the way out? Great job on documenting these Kmarts, keep up the updates. Sad, sad, sad... thank you for the photos, it's very moving to see an American Institution like K-Mart die such a slow, painful death. I really loved this store a lot. I would come here with many of my relatives whenever we were traveling on roadways throughout the Pittsburgh area. It was worth more to Lambert to sell the property. From what I understand this super k was one of the more profitable ones. I was just there on Saturday heading to Gander Mountain and its sad to say that half the building has already been demolished. I worked at this store for several years and its demise made me kind of sad. It's always sad to see big and spacious stores close, only to be replaced with small and crowded stores. What a great mart. I like it. Thanks for sharing this post. Damn I really loved this place. I used to go to "Super-K" all the time, from pretty much the day it first opened. It was a big deal -- The first 24-hour mega-store in the area, prime location -- All before Wal-Mart & North Fayette Pointe & even before The Mall at Robinson. I worked evenings & would go there after work at like 1-2-3 in the AM. Would also go to the Giant Eagle when it was still in Robinson Court. I had no idea that the Super-K had completely closed -- I do remember when the hours changed & it only being open from 6am-midnight, which was an early sign of trouble. And now I see that the building has been torn down -- Anyone know how long ago it was demolished? I worked as a cook at the full service restaurant about 6 months after it first opened. We served daily all you can eat specials and a full breakfast menu till closing as well as a full menu. We had a full staff of waiters and waitresses as well as a hostess. This place was always busy back then and was fully stocked and well organized. Good times! Sad to see it's now long closed and torn down. Thanks for all the photos and your time and effort put forth on this. FYI note. Though the Kmart in this article is referred to as Moon township, us "locals" would refer to this as the "Robinson Kmart". I offer this bit of info only because there is a Kmart that is still open and functioning right the middle of Moon township. It is just 10 minutes up route 376 (60) Maybe the 2 locations being so close together was one of the many factors of its demise. Great article, thanks for sharing! 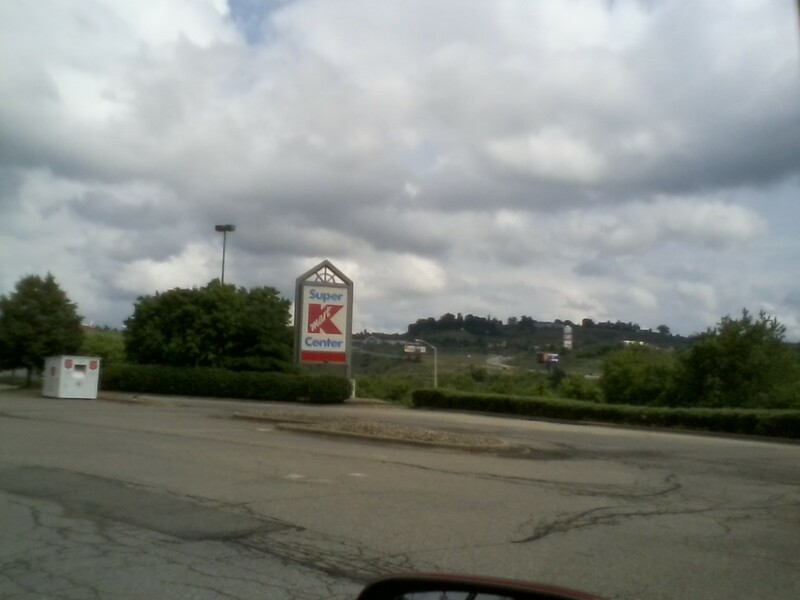 I think this Kmart died because it was built on the wrong hill of the Robinson retail explosion that happened in this area. It sat all by itself up there on the hill and was a pain to get to if you had many places to go to in a trip. And what Kmart offered could easily be obtained from other stores in the other shopping areas in Robinson. So one would have to go out of there way to go to this k-mart. That's why I think THIS particular store closed. If they built over on the other hill I bet they would still be going.